But neither do I think, after all the good she’s done for the community through the league and on her own time, that she should be punished in the court of public opinion for the remainder of her career because of one mistake. Does it make sense that people are mad and maybe a little hurt for a while? Absolutely. 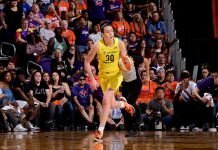 Should she be sacrificed as the Michael Vick of the WNBA? No way. The WNBA All-Star game T-shirt winning design has been revealed. It’s OK, but it’s kind of plain. They should have picked something more edgy. i agree on the shirt, blah. that was THE BEST of the entries? deah gott!